FYI -The African American Burial Grounds Network Act. The six-month-old son of Mary Ann and William Morris died this date, February 22nd, in 1844 and was buried at Bethel Burying Ground. The Morris infant died on a clear day where the temperature rose to 54 degrees. Sadly, Mary Ann Morris would die of Tuberculosis in Blockley Hospital seven years later and was buried in the local Potter’s Field. *The death certificate is not signed by a physician. It is signed by George W. Morse. There is a man by that name listed in the 1844 City Directory as a “card manufacturer” or printer that prints business and social cards. This individual may have been Mr. Morris’ employer and perhaps gives us a hint at what Mr. Morris did for a living. Check the link below for the updated Bethel Burying Ground Timeline. Please click on the link below for the current BBG Name Directory. The six-month-old son of Mary and Josiah Purnell died this date, February 11th, in 1850 and was buried at Bethel Burying Ground. The six-month-old son of Mary and Josiah Purnell died this date, February 11th, in 1850 of Lobular Pneumonia and was buried at Bethel Burying Ground. Mary, twenty-two years old, and Josiah, twenty-nine years old, were both born in Delaware. One of them was born enslaved, according to the 1847 Philadelphia African American Census. * Ms. Purnell was employed as a wash woman. Mr. Purnell worked as a waiter, reportedly earning $10 a month. The Purnells paid $2.50 a month for the rent of a room at 168 Locust Street which was located between 11th and 12th Streets on Locust Street. The red arrow indicates the approximate location of the Purnell home on Locust Street between 11th and 12th Streets. The area was known as “Hell’s Half Acre” because of the level of crime and violence in the neighborhood. The 1847 Census shows that the Purnells regularly attended religious services and owned a total of $75 in personal property. There is some evidence that Mr. and Ms. Purnell suffered the loss of one or two other children, both girls, in 1846 and 1848 respectively. Both girls also are buried at Bethel Burying Ground. Baby Purnell was buried at Bethel Burying Ground on a February day that dawned clear but turned cloudy in the afternoon. The high temperature for the day was thirty-nine degrees. 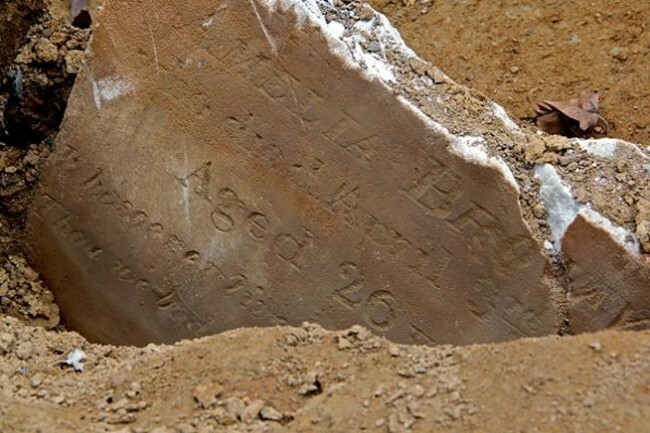 Tragically, Mary Purnell would die four years later in 1854 of Tuberculosis and she was buried in the graveyard of the Philadelphia Alms House. Mr. Purnell would live until 1867 and die at age fifty from “Softening of the Brain.” He was buried at Lebanon Cemetery. *In 1850, it appears from past census records that approximately four out of ten Philadelphia Blacks formerly had been enslaved. The seventeen-month-old daughter of John A. Warren died this date, February 7th, in 1845 and was buried at Bethel Burying Ground. The unnamed seventeen-month-old daughter of John A. Warren died this date, February 7th, in 1845 of Marasmus* and was buried at Bethel Burying Ground. I was unable to locate the name of the child’s mother. The 1847 African American Census is the only document where the Warren family is recorded. The reason for this may be that the family or members of the family formerly were enslaved and had escaped their captivity. This group of people did not tend to be receptive to census takers. The 1847 Census does report a total of six members in the family – four males and two females. Four family members were between 15 years and 50 years of age. There was one family member between 5 years and 15 years and one under the age of 5. Four of the family members were not native to the state of Pennsylvania. The 1847 Census simply states the family lived on Cedar Street which we now know as South Street. There was no house number given. We do know that they paid $7.50 a month for rent which was a hefty amount and may mean they rented more than just one room. The above photo is of the three hundred block of Cedar which now is only several blocks from the Delaware River docks. Mr. Warren sold oysters for a living, so it is likely that the family lived near the eastern end of Cedar Street. Oysters were the fast food of the 18th and 19th century in Philadelphia. Mr. Warren’s income would not have been steady because of the variability of the weather and the seasonal availability of oysters. Given the high rent, other members of the family beside Mr. Warren also had to be employed. Oyster boats cannot work if they are frozen in the January ice. The Warrens’ baby girl died on a day that saw the end of a three-day snow and ice storm that deposited up to twelve inches of snow locally. Traveling within the city was practically impossible. The body at least would have been wrapped in a sheet and kept in the family’s room or apartment. The family may have had a small coffin made. *Marasmus is caused by starvation or a diet totally absent from necessary nutrition. Apart from weight loss, long-term effects of Marasmus in children include repeated infections. Diarrhea, measles, or respiratory infections are serious complications that can be fatal in a child with this illness.